Some Internet scams are new. Others simply use the new technology to reach more people. The Nigerian Scam, also known as "advance-fee" fraud or simply 419 (for its statute in the Nigerian criminal code), is one of the latter. It began by letter in the early 1980s, before moving to faxes and then e-mail. As of ten years ago it was a $5 billion global industry, and by some reckonings it's still bringing $1 million a day into unscrupulous hands in West Africa. This scam, with its variations, is reportedly Nigeria's third-largest industry. You've almost certainly received an e-mail like it. Someone claiming to be a Nigerian (the e-mail might also claim to be from another African country) government or business official or the widow of a government official, offers to put a large sum of money in your bank account to get it out of the country. You'll the split the money, with the lion's share falling to you. The e-mail has a sense of urgency about it. If you respond, you'll receive plenty of official-looking documents to show the offer's legitimacy. At that point you'll typically be asked to provide your bank details as well as an advance fee to cover the transaction costs and legal fees. If you're a businessman you'll also be asked for blank letterhead and invoices to help speed the transaction. However, once you've sent the money an emergency will arise, necessitating that you send more money. Then there'll be another, and another, until you either run out of money or give up. You'll never see the large sum - or the cash you've paid out. You might also be asked to travel to Nigeria or a border country to complete the transaction. On your arrival you'll be asked for more money, then more and more until you're broke or go home. The criminals will sometimes bribe officials so you don't have to pass through Customs. That gives them leverage; if you don't co-operate, they'll turn you in to the authorities. In some cases, according to the U.S. State Department, people who've travelled to Nigeria to collect on these deals have been threatened or beaten. At least one has been murdered, and several reported as missing, presumed dead. Over-invoiced or double-invoiced oil or other supply and service contracts, where the criminals want to get the money out of Nigeria. A bequest left you in a will. Money cleaning, where the criminal claims to have a lot of currency that needs to be "chemically cleaned" before it can be used and he needs the cost of the chemicals. "Spoof banks" where there is supposedly money in your name already on deposit. The fake lottery, where you've won a large prize in a lottery you didn't even know you'd entered, gut have to send a small fee to claim your winnings (this one springs up sent from many different countries). Additionally, there are two Nigerian scams that have become widespread on eBay. An auction winner pays for a purchase with a cheque larger than the amount and asks for the change to be sent to him, but after the money has been sent the original cheque (or money order) proves to be a forgery. The auction winner might promise payment on receipt of goods (C.O.D. ), but no payment ever appears. There's also the fake escrow service. The buyer suggests depositing money into an escrow service, with the cash released on receipt of the goods (frequently a laptop computer). However, the escrow service is a fraud, and once the goods have been dispatched, it closes. Probably the first question to ask yourself when you receive one of these mails is "why me?" This person doesn't know you and has no reason to trust you. It all sounds too good to be true - and it is. The simplest way to deal with an e-mail like this is to click delete. Don't send blank letterhead or invoices. Never send money in response to these scams, however good they look. Send a copy of the original e-mail to both your own Internet Service Provider (ISP) and the ISP of the sender (abuse@hotmail.com, for example). If you're selling on eBay, don't send goods to Nigeria without receiving payment and making sure it's legitimate. These days a number of sellers refuse to even consider bids from the country, an indication of how widespread the scam has become. Never, under any circumstances, travel to Nigeria on one of these scams. You won't see your money, and you could put yourself in physical danger. Sadly, if you've been a victim of this scam or one of its variations, you have very little recourse. There are many reports of high-level Nigerian government officials being involved in the scam. The chances of getting your money back are, unfortunately, negligible. Nigeria is drafting legislation making 419 crimes punishable by a £2000 fine and up to three years in jail. Report the crime to the police. In truth, it won't help recover your money, but it does log the crime. 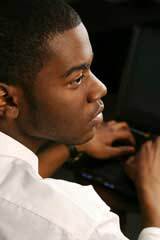 Each year, thousands of people fall victim to these Nigerian advance fee scams. It's become sophisticated and huge, fraud on a global scale. The golden rule with this, as with all scams is if it seems to be too good to be true, then it probably is.